Is there a feminist way to get married? Something strange has happened since my boyfriend and I got engaged recently. We have both discovered a slight aversion to using the word fiancé. Aside from my ridiculous, yet — as I’m sure many who know me will attest — predictable reaction, it was a very special moment and we are still truly over the moon. And although we have both referred to each other as “fiancé” at least once or twice, something about it is still slightly odd to us. I guess the best comparison would be that new shoe feeling. Except that these are fancy shoes; the ones you’ve bought for that specific fancy thing. You’ve longingly had your eye on them for months and have finally splurged all your hard-earned cash to get them, but during the first couple of wears, you still feel a bit too formal. Maybe even a tad ostentatious and probably a little self-conscious. In 2017, the very idea of marriage can occasionally feel a bit jarring. There are contemporary films, television shows, books and articles that are teaching women to value their intelligent, curious minds and to use their strong, willful words as they please. Once-dormant female voices are now hollering left, right and centre for full ownership of their bodies and choices, whether Trump likes it or not. There are voices that actively encourage women not to feel obliged to delay their careers in order to start a family and let them know that it’s fine to not want to start a family at all. And within this, today’s Tinder-swiping, Naked Attraction-watching demographic of young women makes for a more fluid, accepting attitude that encourages a broader spectrum of romantic possibilities. Part of what makes the Millennial generation so progressive is the ability to take elements of certain old ways of life and embed them within the new. 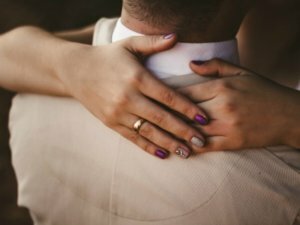 Whilst it’s impossible to completely separate marriage from its patriarchal roots, we should still honour the feminism within a woman’s choice to depart from these traditions and create our own unique celebration of love. Not being particularly religious, neither my fiancé (I said it) nor I have any desire to marry in a church. Nor do we want anyone to feel too formal. The extent of our planning thus far consists of looking at weird barns and trying to work out what is the earliest, most acceptable time to be drinking. There is nothing outdated in cementing a mutual love for one another. I will still be just as loudly feminist and ambitious as before except now with a slightly wider knowledge of centrepieces and wedding planning. Overall though, I’m pleased to say I don’t think I will suffer from too many pre-wedding jitters. To echo Phoebe’s sentiment (The One with the Prom Video, Season 2, Episode 14), marrying your “lobster” is probably the least scary thing you’ll ever do. Image by Allef Vinicius, from Unsplash. Image is of a man and a woman who have just got married. Only the back of the man’s neck and shoulders are visible, with the woman’s hands resting just below the back of his neck as if she is hugging him. She wears purple and gold nail polish on alternating fingers. He wears a pale beige suit jacket.